Locksmiths 247 North Dublin locksmiths is an organization that offers quality and professional locksmiths services throughout Dublin. 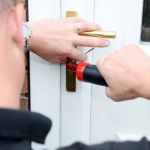 North Dublin locksmiths aim is to provide quality locksmiths in Dublin. It helps in solving locksmith issues at a faster rate which is effective. It ensures minimum impact on ones’ every day activities. In this company, simple keys can be replaced; the job is done professionally and to high standards. North Dublin locksmiths is quite well known for the services which they provide to the clients. This is not only in domestic and commercial, but also in emergency auto locksmith services. It is an award winning provider of high quality locksmith services, which is throughout Dublin. The organization serves all regions where it offers domestic locksmith and emergency auto in Dublin. North Dublin locksmiths has been excellent for the last 14years. It has gained good reputation, which has been brought by full commitments to the work and love for job. The guys in Locksmiths 24/7 are such a delight to work with. They have vans located all across Dublin to attend any of our many Texaco garages. It’s great for a general manager to have the confidence in a contracted company for peace of mind.